Functionally and historically, the sabermetric revolution in baseball is over. Analytics is not some outsider’s method of attacking institutional baseball; it’s how institutional baseball does business. Every single major-league team receives immense amounts of data from MLB about their players’ batting, pitching, and, notably, defense. For some of us, the whole structure of the old trads-versus-quants argument doesn’t even apply. Because I’m relatively young, and because I got into baseball on my own as a teenager, rather than being taught about the game by a parent or an uncle or someone, I never had the chance to absorb the notion that batting average, RBI, and pitcher wins were the numbers that mattered. On-base percentage wasn’t something I had to be convinced to accept; I simply learned what went into the formula and what a relatively good OBP was, and went on with my life. But even if you’ve grown up comfortable with using a wide array of statistics to analyze and quantify the game, the old battles have left their mark. Sabermetrics has advanced so fast that it’s already moving behind the curtain—an approach that ran on publicly available data when Bill James pioneered it in the 1970s is now evolving into a matter of proprietary trade secrets, with teams evaluating players using systems we’ll never see. That still leaves a no-fans land between the old and new approaches, a shortage of resources for those of us who have an interest in sabermetrics but who lack a comprehensive and accessible way to begin learning about modern analytics. 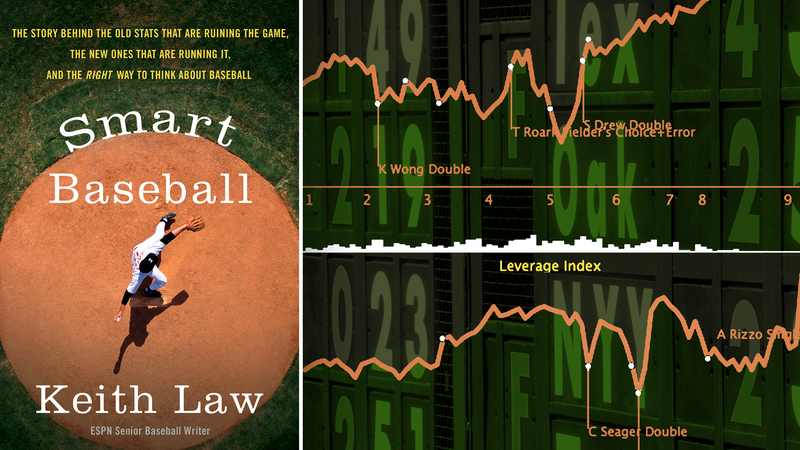 With his upcoming book Smart Baseball, the ESPN analyst and former Toronto Blue Jays front-office expert Keith Law makes a big contribution toward filling that gap. Baseball has always suffered from a sort of inertia. Whether it’s about the rules of the game, replay, or the unwritten code of player behavior, old ideas are hard to unseat. For too long people have put faith in old numbers and stats precisely because they’re old; these are the numbers that the baseball gods graced us with all those years ago so we must follow them—even if there are numbers out there that actually work better. A game with a century and a half’s worth of history has a hard time escaping the gravitational pull of that past. Overcoming that gravity has been the work of generations, going back well before Bill James. In his breakdown of RBI, which competes with pitcher wins as the most pointless canonical stat, Law quotes Branch Rickey writing that “RBIs were not only misleading but dishonest” for Life magazine in 1954. Rickey nailed the most fundamental problem with RBI, however: it is an individual statistic that depends far too much on the performance of other players—in this case, whether the hitters ahead of the player get on base enough for him to drive them in. Barry Bonds, MLB’s all-time career home run leader with 762, hit 450 solo home runs in his career, and had 412 baserunners on for his other home runs. Hank Aaron, whose record of 755 Bonds broke shortly before retiring, hit 399 solo home runs—and he had 482 baserunners on for his other home runs. So even though Bonds out-homered Aaron in about 300 fewer games (and got on base more often and hit for more power in total), Aaron ended up with about 300 more RBI in his career. Bonds was the better hitter, but Aaron gets the RBI glory. It’s a simple example, but one that makes pretty clear the fundamental flaw with a statistic that we still see cited in local baseball coverage and, most notably, on lower thirds that appear on broadcasts during at-bats, as if it were in any way predictive. It’s punchy but a little nonsensical: How can old stats be ruining anything, if the new stats are running things? The irreconcilable differences between the proudly fuddy-duddy subjective work of scouting and the proudly bleeding-edge objective work of analytics have been reconciled for a while now. Law’s own career has followed the thesis-antithesis-synthesis implied in his subtitle—he began writing about baseball in the 1990s for Baseball Prospectus, the forum for stats-minded outsiders; then, in 2002, he was hired by the Blue Jays to be a minor- and major-league scout. Now, for ESPN, he blends both areas of expertise. Smart Baseball is broken up into three segments. The first breaks down traditionally held beliefs about quantifying baseball (batting average, RBI, pitcher wins, and saves); the second gives a detailed walk-through of the statistics that exist now as the baseline standard for fans and analysts (OBP/SLG/OPS, win probability added, WAR, etc. ); and the book finishes with an examination of the Hall of Fame process, Statcast, and the role of modern scouting. The result is probably not too helpful for the full initiates of the Fangraphs crowd—Smart Baseball functions best as a primer in sabermetrics. But fans who have an above-replacement-level grasp of statistics will still find plenty to learn. For me, Law’s book helped cure me of a blind spot about run probability models. I’m a big fan of win probability charts—they’re not predictive, but they can be a fun way to grasp the swings in a game. Run probability, though, is actuarial and prescriptive, the sort of statistic that traditionalists warn about stripping away the game’s randomness and flair. But the game has changed for good reasons, and Law lays them out, throwing cold water on the excitement of stolen bases along the way. Without paying much attention to run probability, one could assume we don’t see many stolen bases anymore because players seem to have gotten bigger and games are won with power hitting. That makes the field of guys who managers should send, statistically, pretty shallow beyond the likes of Dee Gordon, Billy Hamilton, and Trea Turner. It’s not fun, but it makes sense. Law’s overarching argument is that there can be no one true metric of a player’s ability, even as any reasonable person wishes there could be. Individual statistics can tell you how a player performs in a specific manner—batting average tells you the most simple of batting outcomes; on-base percentage tells you how often he hits, and walks, but doesn’t tell you how hard he hits, etc.—but inconveniently, the true comprehensive measure of a player is found by looking a bunch of statistics in concert. So in evaluating the player as a whole, it’s no wonder fans and analysts look for a shorthand. The single-measure solution is what everyone attempts to achieve with WAR. The term “wins above replacement” is almost self-explanatory: “Player X contributed to or detracted from Y wins more than some random call-up guy (Z) would have contributed in his position.” It’s an easy shorthand for productivity and value, but is an imprecise portrait of a player. The formula is mutable, with each iteration determining player value based on different weights of isolated metrics, so Law describes WAR as a “construct” instead of a stat. No formula is going to give you a perfect answer to the value of a player, but WAR serves a distinct purpose. WAR is just a way of adding up the various measurable components of a player’s performance, setting a standard baseline, and using it to compare player value across seasons, leagues, even across eras. When writers mock WAR (and do so with headlines that should prompt Edwin Starr to sue for defamation), they think they’re mocking a single stat when they’re actually mocking the idea of valuing players at all. If you don’t think you can value a player, I guess that’s fine, but the entire industry has decided that it disagrees. That sounds a lot like the answer I give when friends ask me what value I find in baseball statistics. (This happens more often than I’d expect—baseball’s reputation precedes it.) My go-to example is the 2014 NL wild card game in Pittsburgh. When the Giants made it into the second wild card spot, I took an overnight bus to Pittsburgh from New York (and nearly spent my last dollar to do so) to catch the game. In the final game of the regular season, Pirates manager Clint Hurdle had made a Hail Mary attempt at taking the NL Central from the Cardinals and started his ace, Gerrit Cole. It did not go the Pirates’ way, with Pittsburgh losing to the Reds and the Cardinals beating the Diamondbacks. That put the Pirates in the wild card game, and put Edinson Volquez on the mound for them. Volquez was holding up against the Giants’ ace Madison Bumgarner until the top of the fourth inning. Then he allowed a single, a single, and a walk to load ’em up for Brandon Crawford with nobody out. Things could have been worse for the Pirates. Crawford had been having a pretty unspectacular season, spending most of the year batting in the seventh and eighth spots. Against right-handers, he had struck out 25 percent of the time. Volquez got the count to 1-2; Crawford was batting .148 in 1-2 counts, compared to a .166 league average. Volquez threw his fourth pitch. From my standing-room position, I could only see the ball leaving the bat and the players all turning to watch it sail out into the stands, over my head. The crowd fell silent. I screamed into my hands, knowing I was the only Giants fan in the section. More importantly, I knew that in a stacked San Francisco lineup, Crawford was competing only with Brandon Belt for the position of person least likely to have socked a game-breaking dinger. Grand slams by nature are at the intersection of fortune and design: Crawford was batting behind three guys who had managed to get on without making an out; with three on and no outs, Crawford’s job was to knock in a run—a long fly ball off a big swing is a pretty good way to do so; and, finally, Volquez put an 82 mph knuckle curve right in front of Crawford. Madison Bumgarner stonewalling the Pirates was incredible to watch, but to me that game will always be about Crawford silencing 40,000 people with a single swing. His season stats were not predictive, of course, but a simulation likely would not have had Crawford making the difference. That night, as probability met actuality, he became the first shortstop to ever hit a grand slam in a postseason game. The numbers I knew, and the ones I reviewed after the game, told me not to expect much from Crawford in that moment. When he sent the ball over the fence, that knowledge only made the moment sweeter. Smart Baseball is out tomorrow.